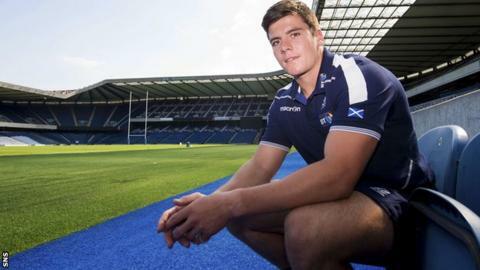 Hugh Blake says he is primed for his Scotland debut despite playing only a handful of elite matches since arriving from New Zealand in December. The back-row was named in Vern Cotter's Six Nations squad before playing a professional match in his adopted nation, but did not feature. "We've had physical in-game situations over the last few weeks," he said ahead of Saturday's Test in Ireland. "Probably before that I was a little bit sceptical, but I'm ready to go." Blake, 22, was initially signed for Edinburgh, but after a loan spell with rivals Glasgow Warriors, will spend the next two years at Scotstoun. He has played three times for the capital side - twice from the bench - but has yet to make his competitive debut for the Pro12 champions. "I've known all along I've been eligible to play for Scotland," added the ex-Otago back-row. "A few years ago after representing New Zealand Colts, the opportunity arose to come across, but I was still on contract with a couple of teams in New Zealand and I decided morally it was right to see out those contracts. "Once they were up I got back in touch and they were keen to get me here; it all happened quicker than what I expected it to." World Rugby's controversial regulations governing international eligibility - where a grandparent, as in the case of Blake, or three years of residency qualifies a player for a given nation - have been exploited almost universally by teams seeking to bolster their player pools. The all-action debutant revealed he was advised to ignore negative press around his arrival by former 'Kilted Kiwi', Brendan Laney, who represented Scotland against his native New Zealand days after stepping off the plane in 2001. "It was very nerve-wracking the first few days - but all the guys are really good guys," said Blake of his integration in the national set-up. "I know where my roots are from - Glasgow - and finally I get a chance to show the public that I can play rugby. "(Laney said) Don't listen to the negative comments, make your mark on the field." In introducing the likes of Blake, and former (Otago) Highlanders counterpart John Hardie to his squad, Cotter has always stressed the need for quality rivalry in his squads. "We've mentioned that before - increasing competition will increase the level of play," said the coach. "I'm not going to get involved in the rules and regulations; I've never been much good at politics. I'll just stick to my role and I feel if we have a whole group of quality players vying for positions, they'll have to improve if they want to get selected. "If they're available for Scotland, we'll have a look at them." Cotter's contract with the national squad was extended on Wednesday for a further year, tying him to Murrayfield until at least 2017. The timing of the announcement was viewed as somewhat curious, given Scotland failed to win a match during the Six Nations, and despite his obvious coaching pedigree, a poor World Cup campaign could begin to call the New Zealander's position into question. "This is the hard cold facts of international sport," he said. "We are working well and obviously there have been a few positive signs up 'til now. "We're continuing to work and improve and that'll be a decision to be made further down the track - at the moment we've got a game this weekend, I'm probably focused a little bit more on that than anything else."